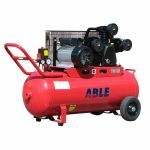 Why buy an electric air compressor from ABLE SALES? Because we stand by our products with a 12 month guarantee on all parts and workmanship. You can also buy a electric air compressor online with fast courier delivery across Australia. Or if you prefer, come and see us in our Melbourne Perth and Brisbane showrooms. Petrol and diesel compressors cannot be used indoors like an electric air compressor can because of noise and fumes that they put out make the electric air compressor a must for indoors, They also tend to be heavier than electric compressors making electric air compressors more portable. Electric air compressors are less expensive than fuel versions making them great at smaller jobs and indoor work. 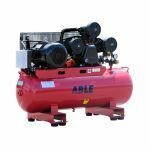 Electric air compressors are offered in portable and permanent styles, and have a stop and start switch, which will turn on the compressor if the tank pressure levels get low. Then, if the pressure levels become too high will turn it off. The motor of the electric air compressor stops if there are no tools being used.